Today in Castlebar District Court, Pat O'Donnell, Martin McDonnell and Gary Bohan were given three 6-month prison sentences each (to be served concurrently) in relation to a protest in support of Maura Harrington, who was on hunger strike at the time. This continues a policy of criminalisation of the community for their protests against the imposition of this untreated high pressure pipeline on their area. 10 people have now been given prison sentences for their opposition to Shell. All three were released with leave to appeal on a bond. 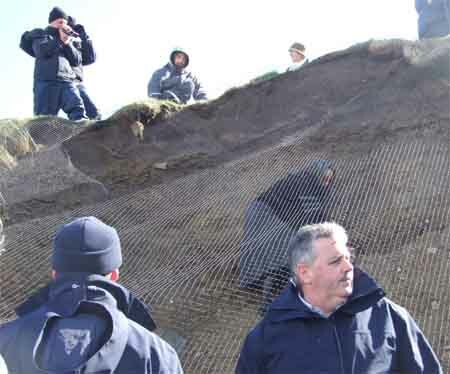 Yesterday in Belmullet District Court, Maura Harrington was sentenced to nine months in prison by Judge Gerard Haughton in relation to cutting a net beside Shell's compound at Glengad. The damage to the net amounted to just 160 euro, and took place in an area that An Bord Pleanala have since stated does not have planning permission. This sentence was initially suspended, but was activated when Ms. Harrington refused to sign a bond binding her to the peace, thereby restricting her right to protest against Shell. Budget 2010 - 'A Fair Deal For Ireland'? Next Wednesday Ireland will learn the outcome of one of the most important budgets in decades, and it won’t be pretty. The talk will be about €4 billion of cuts and €72 billion of national debt, so what about the €420+ billion worth of natural resources off the west coast of Ireland – isn’t that worth another look. Shell to Sea will be one of the groups protesting outside the Dail next week, and they have a point. Shell hope to be pumping Corrib gas by the end of 2010 / start of 2011. Ireland will still be suffering from the recession and seeking ways out of debt. This week, 25 people will appear in court in connection with charges relating to their opposition to the Corrib Gas Project. The courts are on Monday, 7th, Tuesday, 8th, Wednesday, 9th, Thursday, 10th of December in Belmullet District Court and in Ballina District Court on Tuesday 8th. 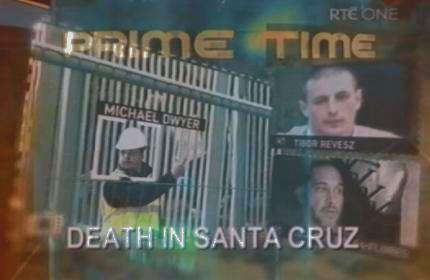 On the 16th December, 3 more local people will appear before the District Court in Castlebar. This is part of the new Erris News, which is available on the Leaflets page here. 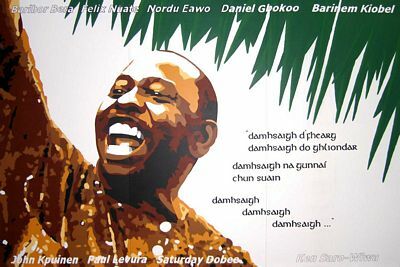 This weekend saw the annual Ken Saro Wiwa memorial weekend being held in Erris, Co Mayo. This was the 14th such memorial weekend, and is held in memory of the Ogoni leader who was hung along with 8 other men because of their opposition to Shell. The weekend was organised as Sr Majella McCarron, who told the assembled crowd during the weekend of how she had worked closely with Saro Wiwa for 18 months while she was in Ogoniland and continued to communicate with him up until the time he was detained and subsequently hung.